The upshot: good news for anti-GM advocates: Monsanto still can’t sell genetically modified alfalfa. 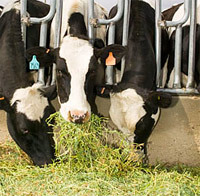 As one of the primary feeds for dairy cows, alfalfa is a crucial part of the food system. The sale of genetically modified Roundup Ready alfalfa seeds (designed to withstand heavy applications of the powerful herbicide Roundup) concerns many sustainable food advocates — especially organic milk producers. This week, in their first decision involving genetically modified crops, the Supreme Court ruled on a California case surrounding genetically modified alfalfa. Although, the ruling was initially reported in the mainstream media as a victory for Monsanto, which created and sold the seeds from 2005-2007, it’s far more complicated. While the justices technically overturned an injunction on the sale of GMO alfalfa, they reaffirmed that its sale should remain contingent on an environmental impact study focused on cross-pollination and contamination. The upshot: Californians have 4 days to comment on the introduction of a noxious new pesticide. The California food and farming community is up in arms over methyl iodide. The fumigant, which has been proposed for use in commercial strawberry farming to replace ozone-depleting methyl bromide, has many scientists, environmentalists and activists worried. Just how toxic is methyl iodide? The California Department of Pesticide Regulation (DPR) is proposing acceptable exposure at levels 96 parts per billion, but that’s 120 times the .8 parts per billion the department’s own scientific review committee says is acceptable for farmworkers. At a State Senate hearing last week, dozens of activists showed up to deliver some 40,000 letters of opposition to the DPR proposal to Governor Schwarzenegger. Concerned consumers may submit comments until June 29. School Lunch Upgrade On the Horizon? The upshot: Congress is in the position to increase federal funding for school lunch for the first time since 1973. 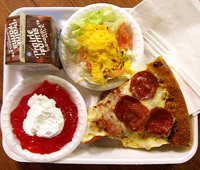 Most healthy school lunch advocates say it would take at least a dollar per meal to reform the convoluted system of commodity dumping and overly processed foods that is the National School Lunch Program (NSLP). In the meantime, however, Congress is inching toward a partial solution. In March, a bill passed through the Senate that would provide an additional 4.5 billion dollars toward school lunches and the infrastructure that supports them. In addition to six cents more per meal, the The Healthy, Hunger-Free Kids Act includes farm-to-school programs and increased training for cafeteria workers. In early June, a similar eight billion dollar bill was introduced in the House of Representatives. If passed, the Improving Nutrition for America’s Children Act would also provide six more cents per meal, while expanding eligibility requirements and nutrition education. The current status quo law has been in place since 2004, was extended for the last year, and – if neither of the above bills makes it through congress by September 30 – may be extended again. See Kim O’Donnel’s useful School Food Cheat Sheet for an in-depth look at the issue. In a tongue-in-cheek call for immigration reform, farmworkers are teaming up with comedian Stephen Colbert to challenge unemployed Americans: Come on, take our jobs. A Pennsylvania farmers breaks down the cost of farmers market food. Photo of cows eating alfalfa by Mike Shipman of Blue Planet Photo. School lunch photo by Jay Morthland. 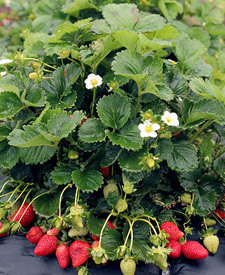 Photo of strawberry plant by Gwen Harlow.